When Orange and T-Mobile came together in the UK’s biggest joint venture, our brief was to launch the brand internally to 15,000 employees across contact centres, over 1,000 stores and Head Office. With the brand purpose defined as ‘Now You Can’, our challenge was to bring the concept to life and create the cultural identity, purpose, values and behaviours for the UK’s first 4G network, EE. It was vital that employees felt fully engaged with the brand internally ahead of launch, so they could communicate effectively with consumers and become our the brand’s strongest advocates. We also wanted an interactive and mobile way of communicating with employees that reflected the values of the new brand. 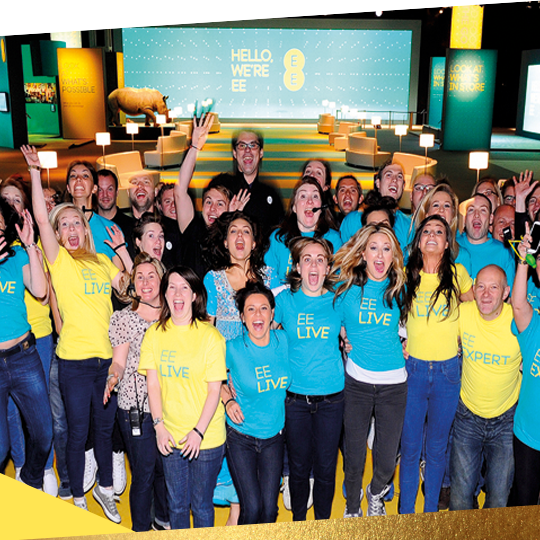 We activated the brand internally with EE Live, a fully-immersive five-day event at Birmingham NEC for 20,000 employees, which brought to life ‘Now You Can’ and allowed teams to experience all the elements of 4G - speed, reach, innovation and technology. Over 90% of employees attending the event said they would recommend the EE brand to family and friends. The brand was rolled out internally using Splash, a bespoke social network that allowed EE employees to interact with the new brand in a completely digital way. Over 75% of employees registered as Splash users and the platform became the priority broadcast channel for the business.